Looking for aluminum fencing in Apex, North Carolina? Fence Workshop™ of Apex, NC is a distributor of Ameristar Echelon aluminum fences and products. Echelon fences are beautiful, functional and built to last a lifetime. We aim to supply aluminum fence in Apex that matches the lush and picturesque town it’s in. We have the experience and techniques you need to make your aluminum fencing project a success. Because we are wholesale distributors of aluminum fencing in Apex, we are able to offer some of the most competitive prices supplying aluminum fences in and around Apex, North Carolina. 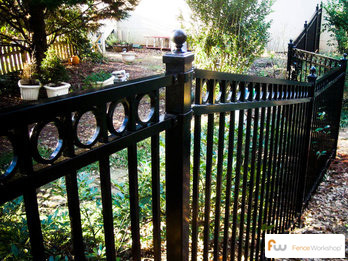 Why choose Fence Workshop™ for aluminum fencing in Apex, North Carolina? We supply all styles of aluminum fencing for both residential and commercial customers. 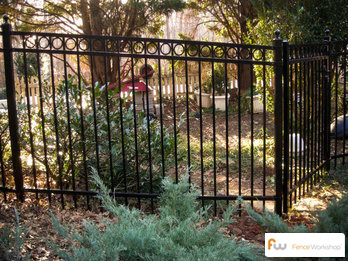 We supply aluminum fence additions like scrolls, rings, ball caps, walk/pedestrian gates and driveway gates. Because aluminum is so rust resistant, all of our aluminum fences come with a best in class manufacturer warranty. 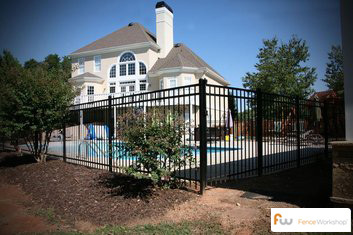 We supply aluminum fences in Apex, North Carolina and surrounding areas like Raleigh, Oxford, Wake Forest, Durham and more.